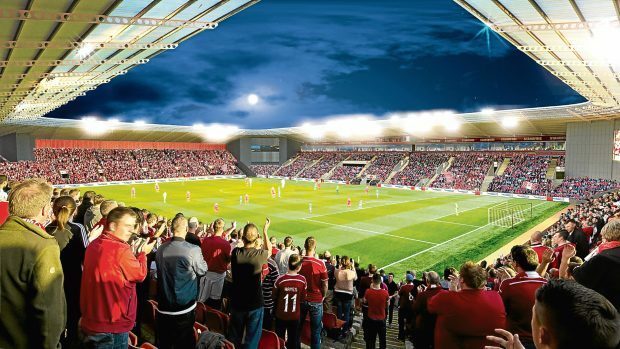 Interior of how Aberdeen FC's new stadium could look at Kingsford. Will it be the Don of a new era? Or will the Kingsford development leave the SPFL club looking red-faced? The debate over Aberdeen FC’s plans to relocate from Pittodrie to a new £50million facility in Westhill has provoked strong emotions on both sides. Those in favour claim it will have huge economic benefits in addition to providing the city’s only major football club with the tools it needs to tackle Celtic and Rangers. But critics retort that the proposals – which have been recommended for approval by Aberdeen City Council, in advance of Monday’s meeting of the authority – drive a bus through the local development plan and are wildly over-optimistic. Most Dons aficionados favour the scheme, with polls showing 75-80% supporting the decision to leave Pittodrie after 115 years. And the Aberdeen chairman, Stewart Milne, has no doubt the Granite City has to grasp this opportunity with both hands. He said: “Kingsford provides AFC with a once-in-a-lifetime opportunity to deliver an exceptional sporting facility that will be unique in Scottish football, helping the club to sustain and build on its current performance. “It will also create community and educational facilities which will have major socio-economic benefits for Aberdeen city and the wider region. “By co-locating the stadium and training facilities, the region will benefit from a major centre of sporting excellence and community hub which uses the the power of football to inspire the public to improve their sports performance, health and wellbeing. “The community aspects of our plans are at the heart of our ambition for a successful one-club city. Through AFC Community Trust, we are already touching the lives of 17,000 people from all ages and all walks of life. Mr Milne has explained how the venture will be funded, although his opponents have claimed some aspects of this remain open to interpretation. He added: “Kingsford represents a £50million, private investment in the region which, according to independent consultants, will deliver over £8.5m of additional annual GVA and create 400 new construction jobs. “Aberdeen City Council’s economic development experts have stated that the overall economic contribution could exceed that of the new AECC. “With the SFA, SPFL and Scottish Rugby supporting our plans and committing to bringing more international matches to Aberdeen, the leisure tourism benefits are compelling. “The club has secured 60% of the £10m required for phase one: the community and training facilities, with the remaining £4million to follow quickly after a positive planning outcome. “Debt-free and with a strong balance sheet, the club is well positioned to tackle the second phase of funding for the stadium and the sale of Pittodrie should provide around 40% of the funding. He knows there has been vocal condemnation of the project and that final permission will probably rest with the Scottish Government. 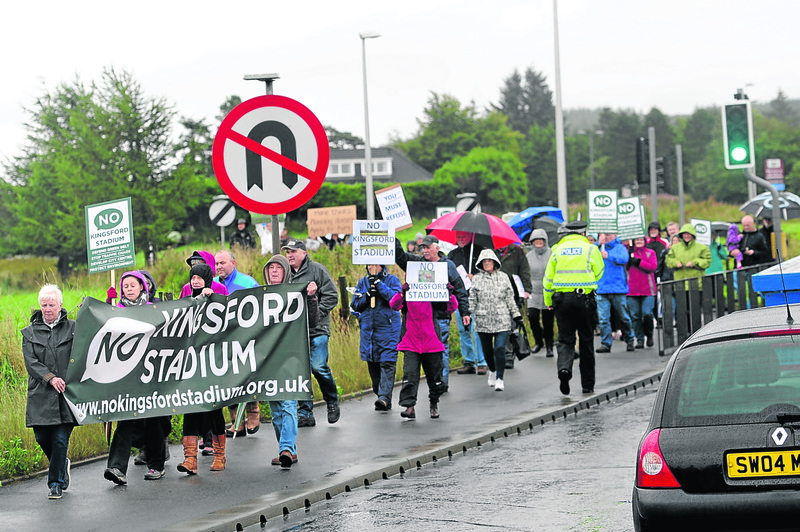 But he said: “Over 75% of our fans support the move to Kingsford and almost 53% of the overall representations to the planning department have been in support. “Typically, only those objecting to a scheme take action, so it’s a huge endorsement of our plans that so many people have voiced their support. “As a region we need to deliver progress at pace. We must build on the recent momentum following one of the longest downturns in our economy. The No Kingsford Stadium group has denounced the economic claims made by Aberdeen FC for the new stadium and compared them to the grandiose statements of Donald Trump, prior to building his controversial Menie Links golf course. Heather Brock, director of the organisation, yesterday told the Press and Journal why she and her colleagues were so opposed to the venture. She said: “In moving to Kingsford, the Dons will try to achieve something which has not been done successfully by any UK football team – move to a site seven miles from the city centre and from their historic home at Pittodrie. “No other Scottish club has moved so far out of their city. Those who have moved just a few miles have seen attendances fall and an associated impact on performance and club finances. “Supporters will soon fall out of love with the club after waiting for a shuttle bus or spending twice as long as before travelling to and from the game. “The transport plan depends on every bus being 100% full 100% of the time. And when the buses won’t work, people will move to cars. The travel plan will see the west of Aberdeen in gridlock for hours. “And supporters will eventually vote with their feet and stay at home. “Just like Trump’s Menie estate, the Kingsford plans make grand claims of economic benefit and, just like Trump, these claims don’t ring true and don’t stand up to scrutiny. “Like Trump, AFC are claiming they will bring large-scale sporting events to the city, boosting the city economy by millions. Ms Brock revealed that a recent survey of businesses around Pittodrie by NKS had highlighted concerns about the new venture. She added: “A total of 71%, that’s 30 of the 42 bars, cafes and shops surveyed, said that the move to Kingsford would have a detrimental effect on their business. “Most people agree King’s Links would be the best location for the club. It’s in the heart of the city, within the community the club works to support, maintaining and supporting businesses that depend on income from those attending games. “King’s Links would be a focus for regeneration in keeping with the City Centre Masterplan.